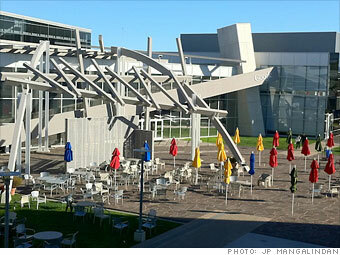 The Internet giant is well known for showering its employees with envy-worthy benefits. Here's a look at recent efforts to keep Googlers happy. Even in Silicon Valley, Google is a giant. It has nearly 32,000 employees cranking on everything from cell phone software to search algorithms. "People have a tendency in larger organizations to create their own hierarchy, so we do a lot of things to counteract that and make it feel more intimate," says Laszlo Bock, Senior Vice President of People Operations at Google. Part of those efforts include setting the bar high when it comes to keeping Googlers happy with benefits few other companies can match, whether it's free gourmet food, on-site laundry, dry-cleaning, and alterations, an outdoor sports complex, or the star-studded lineup of speakers. Here, check out some of the newer perks that help make Google Fortune's best company to work for. Fat paychecks, sweet perks, fun colleagues, and over 70,000 job openings -- these employers offer dream workplaces.